• To discuss arising of signals in different systems. 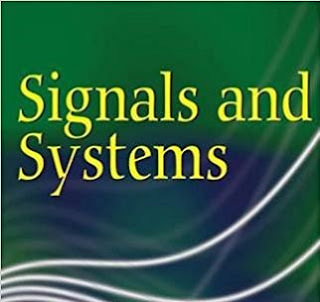 • To classify the signals and define certain elementary signals. • To explain basic operations on signals and properties of systems. • To explain the use of convolution integral and convolution summation in analyzing the response of linear time invariant systems in continuous and discrete time domains. • To explain the properties of linear time invariant systems in terms of impulse response description. To explain determination of response of a given linear time invariant system and to provide a block diagram representation to it. • To explain Fourier transform representation of continuous time and discrete time non – periodic signals andthe properties of Fourier Transforms. • To explain the applications of Fourier transform representation to study signals and linear time invariant systems. • To explain the use of Z-transform in the complex exponential representation of discrete time signals and the analysis of systems. Introduction: Definitions of signals and a system, classification of signals, basic operations on signals. L1 – Remembering,L2 – Understanding,L3 – Applying, L – 4 Analysing, L5 – Evaluating. L1 – Remembering,L2 – Understanding,L3 – Applying,L4 – Analysing, L5 – Evaluating. L1 – Remembering, L2 – Understanding, L3 – Applying, L4 – Analysing, L5 – Evaluating. L1 – Remembering, L2 – Understanding, L3 – Applying, L4 – Analysing, L5 – Evaluating..
• Classify the signals and systems. • Explain basic operations on signals and properties of systems. • Use convolution in both continuous and discrete domain for the analysis of systems given the impulse response of a system. • Evaluate response of a given linear time invariant system. • Provide block diagram representation of a linear time invariant system. • Apply continuous time Fourier transformrepresentation to study signals and linear time invariant systems. • Apply discrete time Fourier transform representation to study signals and linear time invariant systems. Use Z-transform and properties of Z transform for the analysis of discrete time systems. Engineering Knowledge, Problem Analysis, Modern tool usage,Ethics. The question paper will have ten questions. Each full question is for 16 marks. There will be 2full questions (with a maximum of four sub questions in one full question) from each module. Each full question with sub questions will cover the contents under a module. Students will have to answer 5 full questions, selecting one full question from each module.